Guess what?! 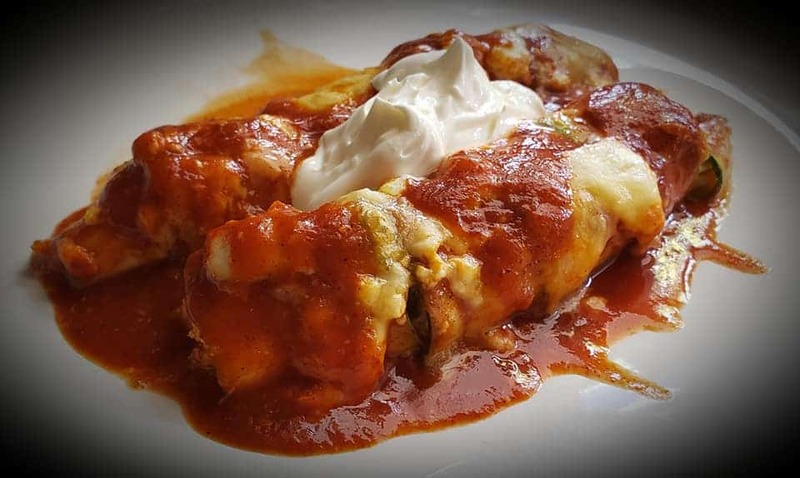 I’ve got an amazing Keto Chicken and Cheese Enchiladas recipe for you!! If you are part of the Low Carb Inspirations group on Facebook, you’ve probably already seen this recipe. It was submitted by our wonderful member, Rachel L! 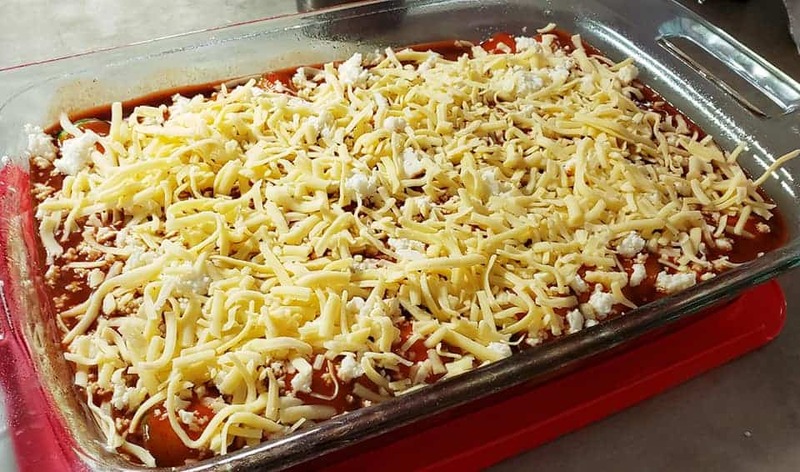 Just look at how yummy these enchiladas look! So many members have already made them and raved about how good they are that we just had to share this recipe with the world! 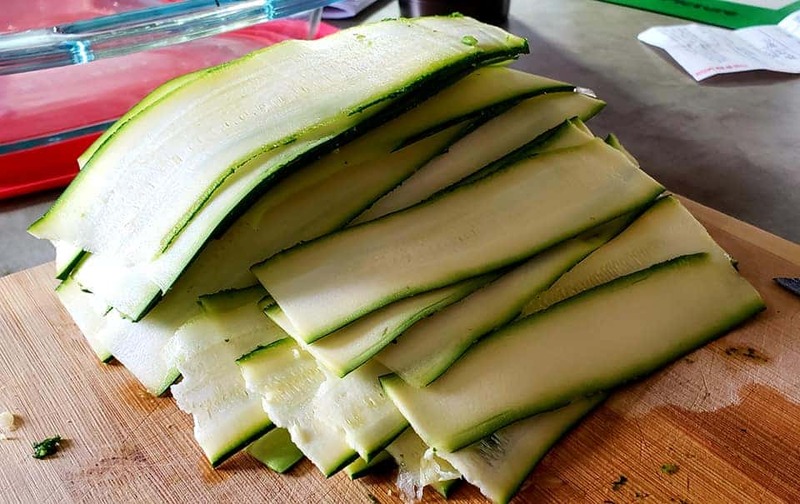 Thinly slice 4 medium zucchini, leaving out the core when you start getting too many seeds. (I don’t have a mandolin, so I used a veggie peeler to get them nice and thin.). I used a handheld veggie peeler. You could also use a mandolin. Boil and shred three boneless, skinless chicken breasts, then mix with about 5 oz. cream cheese, one small can of diced green chilis, 1 tsp salt, 1 tsp pepper, 1/2 tsp cumin, 1/2 tsp chili powder, and 1/2 tsp garlic powder. 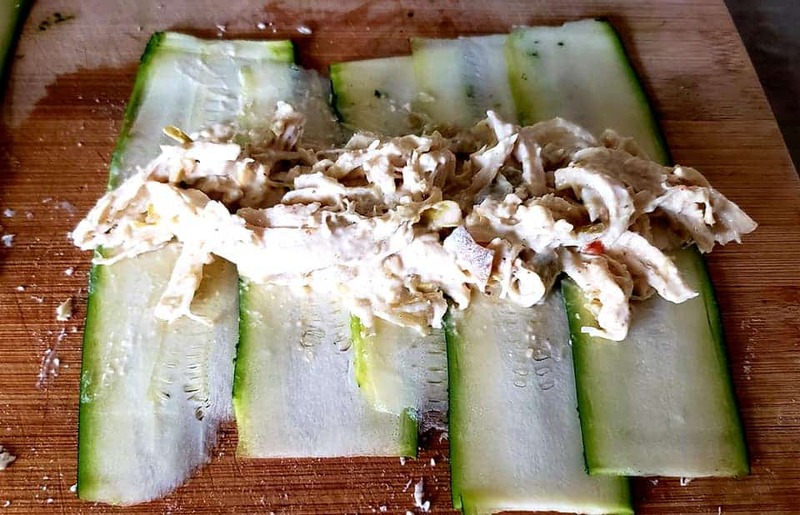 Place about 4 Tbsp of the chicken mixture across 5-6 overlapping slices of zucchini. Roll as tightly as possible. (My sushi skills definitely helped out here! 😉). The first couple were challenging, but you get the hang of it. Transfer to a baking dish with a spatula to keep nice and intact. Top with Red Rosarita enchilada sauce crumbled queso fresco, and shredded Monterey Jack cheese. 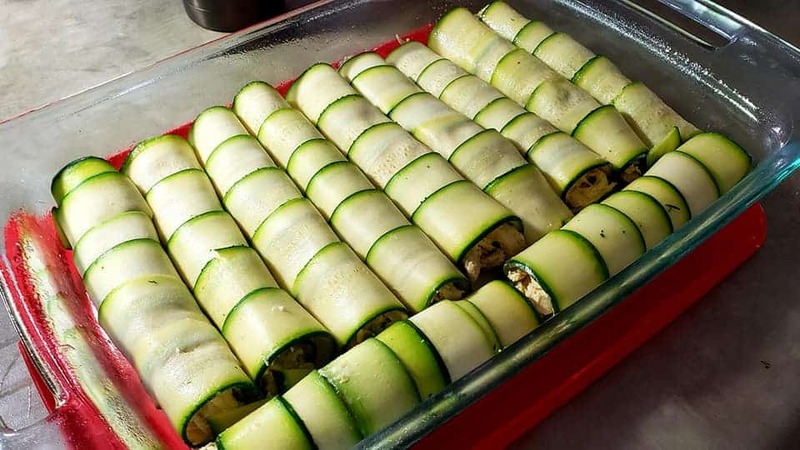 Bake in 375° F oven for about 45 minutes until bubbling and zucchini is nice and tender. This is the carb manager breakdown for one enchilada using my recipe. 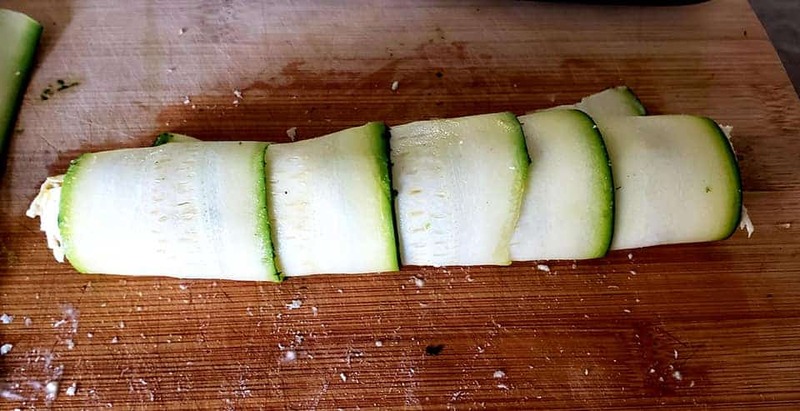 Thinly slice 4 medium zucchini, leaving out the core when you start getting too many seeds. (I don't have a mandolin, so I used a veggie peeler to get them nice and thin.). I used a handheld veggie peeler. You could also use a mandolin. You may also like this low carb salsa verde chicken casserole. 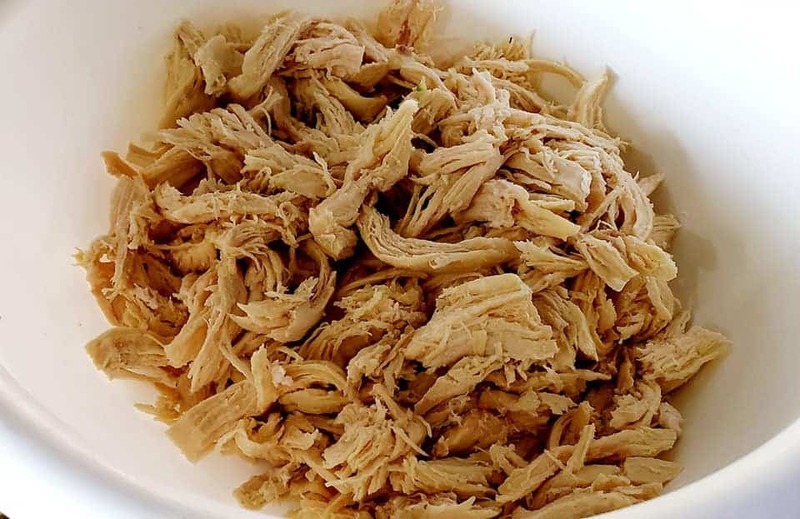 By Jennifer on January 30, 2019 Casseroles, Chicken recipes, Keto Dinner Recipes, Keto Friendly Recipes, Low Carb Recipes, Recipes.